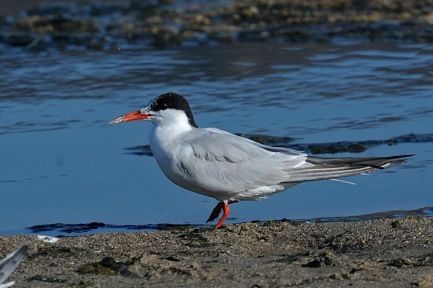 Common Terns (Sterna hirundo) are not especially common anywhere on the U.S. west coast. World population is at least 250,000 pairs and possibly as high as 500,000 pairs, of which about 35,000 pairs nest in North America, primarily in central-eastern Canada, but also along the Atlantic Coast from South Carolina to Labrador. The Canadian population migrates mainly along the Atlantic coast, which is why California sees so few. Most Common Terns winter along the coastlines of South America, Africa, India, Southeast Asia and Australia. Occasionally we do find them at Malibu Lagoon, usually not for long, as they are on their way to or from Mexico and South America. Since 1979, our monthly walks at the lagoon have found a total of fourty-nine birds on twelve visits, as follows (month: visits/birds): July: 1/1, Aug: 1/2, Sept: 4/13, Oct: 1/10, Nov: 1/1, Dec: 1/1, Jan: 1/5, Apr: 1/15, May: 1/1. They may appear in nearly any month (nine out of twelve) but September is the most likely. They closely resemble the far more common Forster’s Tern. The most noticeable difference in winter is the back of the head. 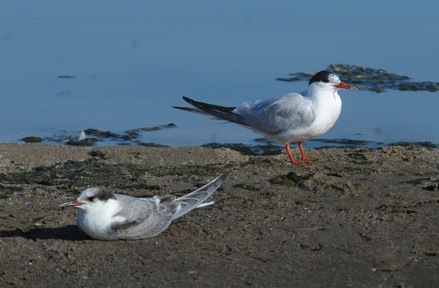 On the Common Tern, the black extends from eye-to-eye around the back of the head. On the Forster’s the black is restricted to a patch around each eye, with a paler shade of connecting gray across the back of the head. Juvenile and first summer Commons have a dark carpel bar (see wing of left bird above) which Forster’s lacks. There are also subtle differences in bill color, leg length and black in the outer primaries, best left to those able to view both species. Western Meadowlarks are another visitor to the lagoon. Although they prefer prairies, grasslands, and meadows, as one might expect from their name, the sandy islands and shores are sufficiently similar habitat to hold their attention and presence. Western Meadowlarks can be found from the Pacific Ocean to east Texas and Michigan, and their breeding range overlaps with the Eastern Meadowlark from central Arizona to Wisconsin. The best way to tell their plumages apart is by the amount of yellow on the cheek (more on the Eastern) and the thickness of the black chest-“vee” (thinner on the Western). Their songs are different, both are very musical and lively, a delight to hear. I have read that when the two species meet, the differences in song and courting responses prevents the completion of courtship. We regularly find Western Meadowlarks at the lagoon in fall and winter as follows; twenty-four visits with sixty-five birds (month: visits/birds): Sep: 6/24, Oct: 8/23, Nov: 4/7, Dec: 3/4, Feb: 2/4, Mar: 1/3. The best place to look for them is in the large flat area nearest the highway between the parking lot and the lagoon; if they aren’t there, they may be on any of the sandy islands. Unfortunately, they rarely sing at the lagoon. The blame, or credit, for the English names we use for birds can be placed primarily on British ornithologists and birders of earlier centuries, who tended to name birds based on how closely they resembled native birds of Britain. Lark species in England, members of the nearly worldwide family Alaudidae, all have white outer tail feathers, easily visible in flight to birders who carried shotguns rather than binoculars. Thus, around the world, if you hear of a bird species with “lark” somewhere in their name, they will have white outer tail feathers: Lark Bunting, Lark Sparrow, Magpie-lark. In what may be an odd example of convergent evolution, the plumage of the Yellow-throated Longclaw of sub-Saharan Africa is almost identical to that of our meadowlarks. 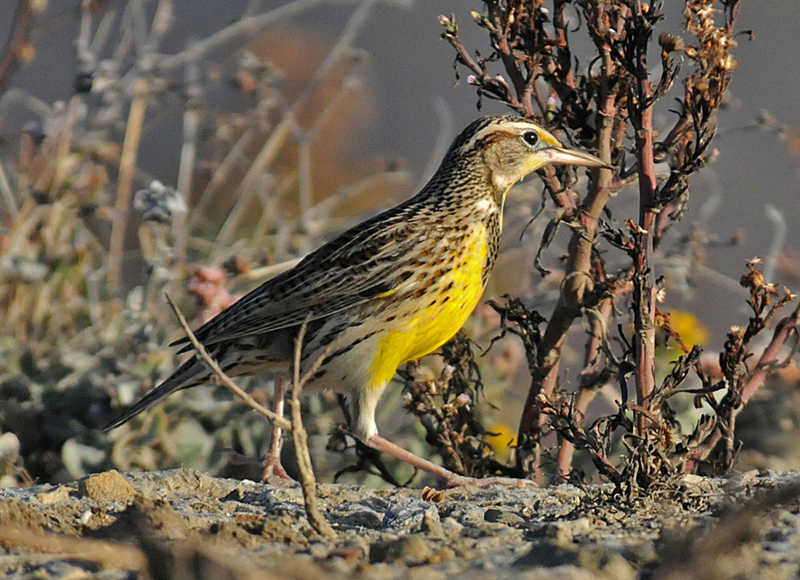 It inhabits grasslands, frequently walks on the ground, and sings from a raised perch, as do our meadowlarks. Yet it is quite unrelated, belonging to the Motacillidae (Pipits & Wagtails), while our meadowlarks are members of Icteridae (New World Orioles and Blackbirds).